Checked mine last night and I can't see any offset at all. Mine looks to the eye that it's parallel to the Steering wheel and lointing straight at me ? 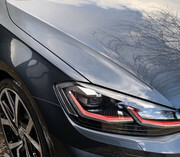 I'm on my 2nd Mk7.5 and can't say I've noticed it on either. And I'm someone who notices stuff. Sounds like a manufacturing fault. Thank God for that. Not sure I could handle that AND a volume knob where the power logo doesn’t stay the right way up! It winds me up in the wife’s Polo. Haven’t even got the GTI yet. Golf GTi Performance Edition (2019), 5dr, DSG in Issac Blue with rear camera, keyless entry, Dynaudio, Brescia alloys & Dynamic LED headlights. I went to the dealers today to look at another gti. The display was the same as mine. I’ll check mine (car) when I pick it up in 7 or 8 weeks. I’d definitely notice something like that. I know what OP means. It can look a little bit skew whiff if you look let your brain tell you that because of other lines on the dash, but it isn't. Measured both AID dials to the back of the steering wheel and the distance is identical. I was out in the car this morning, parked up waiting for a friend to arrive, and I can now see what the OP means. It's only ever so slightly angled, a few degrees max, but it is angled. I'd go as far to say that it's the entire dash that has the angle and the steering wheel might be the same! Page created in 0.154 seconds with 34 queries.